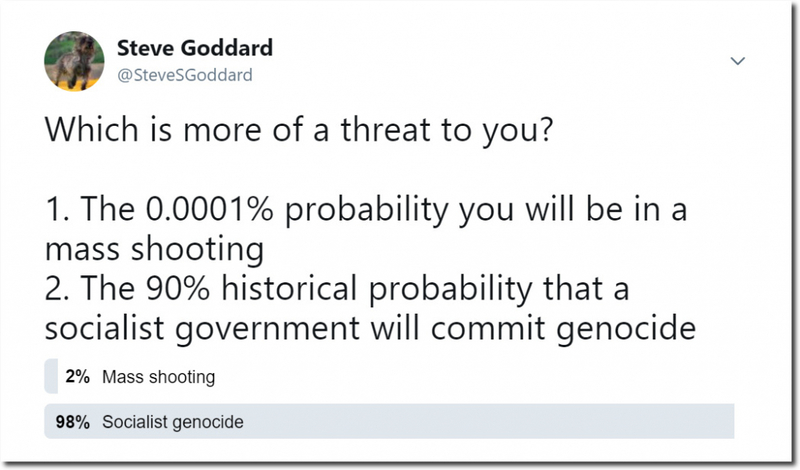 Steve Goddard on Twitter: “Which is more of a threat to you? “The Soviet Story” on YouTube. First watch the introduction by Glen Beck. Also WUWT did a piece on Jordan Peterson but I believe he could be part of a death blow to the man made climate change story. It’s politicized and anti human. Unfortunately, the United States is headed for exactly the socialist genocide you speak of. It will be impossible to stop as long as the 17th Amendment is in effect. For those who don’t understand the 17th Amendment and/or why it is perhaps the most destructive amendment to our Constitution ever implemented, watch this little snippet from Bill Whittle and do a little research on your own. Our Republic cannot survive as long as the 17th Amendment is in effect. We are nearing collapse now. It absolutely boggles my mind that the States would ratify such an amendment. You can largely attribute this to William Randolph Hearst, who used his media empire at the time to spread fear and propaganda which pushed the public opinion for the 17th Amendment. Only because the legislatures are the result of Republican gerrymandering. The 17th amendment means that the Senate can’t be fixed by gerrymander. If the districts were drawn by a neutral authority then you would have a quite different result. With Republicans clinging to the House of Representatives facing a blue midterm wave, and the 2020 census right around the corner, gerrymandering has suddenly become a hot topic. Democrats are particularly worried that Republican-drawn districts will be too high a wall to breach, no matter how hard they campaign, or how big the wave. Like the author of this column, my neighbors and I elected a man to represent us, and the dems didn’t like him, so they created a district two hundred miles long to find the votes to oust him. Hopefully not, The districts should be properly drawn by neutral commissions. The reason it has attracted more attention recently is because the 2010 redrawing by Republicans was the first where a computerized mapping procedure was used which meant that it was done much more precisely than previously. That’s why the ‘blue wave’ wasn’t as dramatic as polls suggested. This was designed to place Democratic voting African-americans in one district by the Republicans. That’s why the ‘blue wave’ wasn’t as dramatic as polls suggested. That is an opinion. Why do you present opinion as fact Phil? Nationwide as far as the house is concerned gerrymandering is estimated to give the Republicans a 3% advantage. One state which has a Republican gerrymander is Michigan, in these midterms for the state senate Democrats won 2,092,164 votes vs Republicans 1,917,150 votes (D 52%, R 48%), the outcome was Republicans 58-52 Democrats. In the State Senate, Democrats received 2,062,494 votes while Republicans received 1,945,209 but the Republicans won a 22-16 majority. That’s fact not opinion. Fortunately Michigan voters on Tuesday night approved by a wide margin a proposal that will establish an independent redistricting commission to draw legislative and Congressional districts. I would start with the income tax or any other form of direct taxation. People first have to learn again what liberty means before they understand why BIG Government is bad also on a State level. You can only limit governmental power if you can limit their budget. There are no good cancers. That’s why progressive government hates a gold backed fiat money system. It limits government’s power to grow BIG. I write to broaden one’s understanding of government induced genocide. Government induced genocide is extends far beyond than killing (by gun fire, starvation, sterilization, abortion … ) out of favor population segments. Government causes more deaths and misery by squandering social resources than by deliberately killing people. Governments tend to allocate to immediate consumption resources better allocated to maintaining and expanding society’s future ability to provide goods and services. Let me put this another way. Governments tend to indulge the glutenous influential with a second or third serving out of seeds, herds, flocks, human capital, physical capital and other resources better invested in the future. A n inevitable consequence is a declining standard of life. Venezuela, since Chavez took over. Zimbabwe, since Mugabe took over. Cuba, since Castro took over. China, between Mao’s take-over and the early 1990s. Pls note, my focus is government genocide rather than genocide by socialists. Two edits are needed to clarify my point. The initial comment was intended to broaden discussion beyond genocide to government meddling’s inevitable adverse consequences for the quality of life.